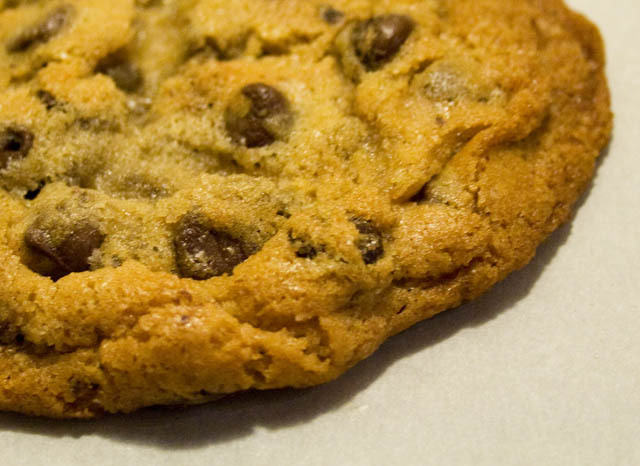 I, like many others, have a ‘favorite’ chocolate chip cookie recipe. Well, to be precise, *two* favorites – one for when I just want a whole mess ‘o delicious little chocolate chippers (Nestle’s Tollhouse recipe, scooped small and made with dark brown sugar instead of light), and the other for when I want a large, chunky handful of chocolate chip goodness (Desaulnier’s Mrs D’s cookie recipe). So I wasn’t really looking to try another recipe, but when the NYT did their cookie cook-off and selected Jacques Torres’ recipe, I had to give it a try. I made a substitution in the chocolate called for – I have really good semisweet callets on hand, but at the price they go for, they’d price this cookie right out of contention for the business. So I used Ghirardelli’s chocolate chips instead, and I don’t think it detracted from the final product in any way, I have to say. I’ve also tried the recipe using the original flours called for (cake and bread), and once with Lily’s all-purpose (a nice soft flour), and the difference was undetectable – so save some time! There are two big deals about this recipe that really take the choc chip cookie up a notch – the first is the notion of aging the dough for 36 hours after you make it, but before baking it. As many others have done, I tested it fresh and aged, and wow – the difference is truly striking. The flavors deepen and meld together wonderfully. The second is the addition of a sprinkle of sea salt on the top right before baking, and that hint of extra saltiness really sets off the chocolate flavors. 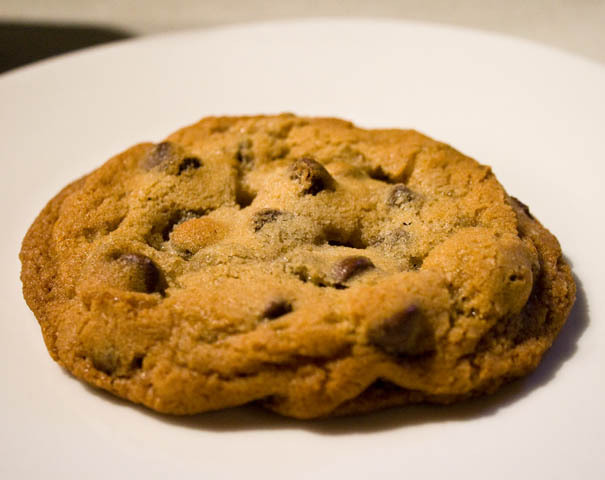 The cookies themselves come out huge – at least 5 inches across – with crisp outer edges, making way for a delightfully soft and chewy interior. You can see the glint of the little salt crystals – yum! The dough freezes like a dream, although next time I’d go to the bother of chilling it a little first, then rolling into logs – it would make carving out 3.5 ounce chunks much easier! Wrap well and keep away from “mice” who may nibble at it while it’s in the freezer (a perennial problem at our house), possibly by hiding it underneath a bag of vegetables. I only needed to add 2 minutes to the cooking time when using dough straight from the freezer. Definitely adding this to the arsenal – it beats out Mrs. D’s on its texture combinations- both crunchy and chewy, and matches it in richness of flavor. Not to mention, it’s less expensive to make! Suggested serving: With a nice cup of coffee or tea, preferably in front of a toasty fireplace.